Posh full-back Jason Naismith in action. Right-back Jason Naismith insists no-one should get disheartened by Peterborough United’s worst performance of the season on Saturday (September 1). 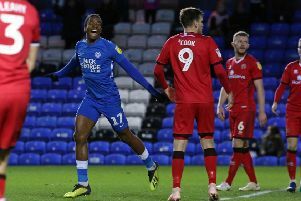 Posh escaped with a point after being outplayed by former manager Grant McCann’s slick Doncaster side at the ABAX Stadium. Centre-back Ryan Tafazolli salvaged a 1-1 draw with a second-half header. Ryan Tafazolli equalises for Posh against Doncaster. The standard of the Posh display caught many by surprise, but Naismith is confident the performance will be used as motivation for the trip to Southend United this Saturday (September 8). Posh are expected to field a much-changed side in their opening Checkatrade Trophy at MK Dons tomorrow (September 4). “We fell well below the standards we have set this season,” Naismith said. “But we didn’t lose, we are still unbeaten, probably undeservedly and we are still top of the table so there is no point in getting downhearted by the performance. “We weren’t at it in the first half at all, but the important thing is to learn from it and put it right for the next game. “To be fair to Doncaster they were very good. They were the best team we’ve played this season. They moved the ball very sharply and we were lucky to only be a goal down at half-time. “I did think once we equalised we might go on and nick it because we’re on such a good run, but that would have been very harsh on Doncaster who were better than us. “You don’t always get what you deserve in football though. You can’t play well in all 46 games. There will also be times when you play well and lose so we will treat this as a good point, one that could be crucial come the end of the season. Naismith could sit the game out at Stadium MK where latest signing Jamie Walker is expected to make his Posh debut after a transfer deadline day loan move from Wigan. Naismith believes the attacking midfielder will be a terrific signing.